“Take that” hints Robbie Williams, as he contemplates ending singing career, for life as a ufologist! Robbie Williams is on strike with the EMI record label, and hints that he is about to finish his singing career to become a Ufologist. I would usually take this news with a pinch of salt, and say “yeah right”, but this might have some substance, as i do know that he has been interested in the subject for a while, at least, probably longer. “Singer Robbie Williams claims that he has encountered a UFO at least three times.The ‘Feel’ star – who has previously battled drug and alcohol addiction – also says he’ll quit his singing career to study aliens after his series’ of extra terrestrial experiences. He said: “I’m stopping being a pop star. I’m going to be a full-time Ufologist” (extract from article). The Mirror (a tabloid british newspaper), is less generous, but i bet Robbie’s used to them treating him like that; the article can be seen here . Mmm, and they are always giving us such quality news and quality investigating, not. There are other sources, but to be honest they all say virtually the same thing. Anyway, if he does start to investigate his interest in Ufology full time, i wish him good luck…. This entry was posted on March 8, 2008 at 9:52 pm	and is filed under are we alone?, extraterrestials, news, newspapers, out of this world, science, ufo, ufo's. 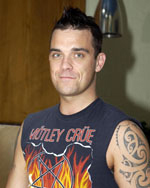 Tagged: Robbie williams to become a full time ufologist?. You can follow any responses to this entry through the RSS 2.0 feed. You can leave a response, or trackback from your own site.